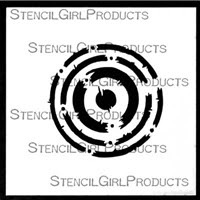 featuring his new stencil designs from StencilGirl Products. and used the Urban Insider Star too. Then covered it in Golden Brand Gesso. I wanted it to be in the background to start with. I used some Perfect Pigment Acrylics and the Perfect Glaze on top of this. It gave it beautifully intense colors. I used a brayer to lay some color down and also to lift some color up. I played with my background until I was happy with what I had. And some paint splats and drippiness needed happening. First I wrote it in red but realized right away that it needed to be in black. No worries. It's about playing and trying new things. The page seemed kind of plain at this point. 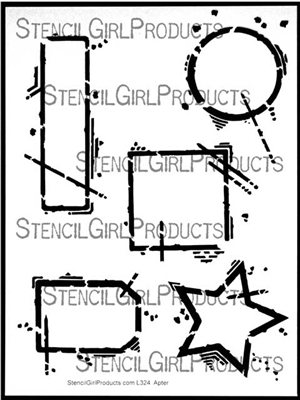 I could use the long rectangle on his Urban Outsiders Stencil. The Groove Tool makes it so easy to apply the ink. 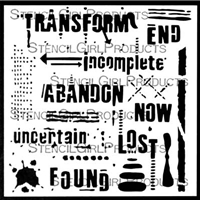 from his 6x6 Transform Stencil. And of course I used Seth's stencils in my Daily. I started with the large rectangle again on the Urban Outsiders Stencil. There were some words on the 6x6 Transform Stencil. So I shaded colors and played and added texture and drips. It made a great border for along the top of this spread. Making it more like a unit instead of individual squares. Seth Apter always comes up with unique designs! leave a comment on each blog for more chances to win. Love the way you used the circle for a border! Totally digging Seth's new stencils! Janet, your showcasing of these is fabulous!! Love love love! Great getting to see your process! Stencils are so versatile ! I like the way you used the squares and circles as borders. I'd love to play with Seth's new stencils. Vibrant colors. Love the quote. Is very true. thanks for sharing a wonderful journal. What amazing colors, and I love how you blended them together, with the stencils peeking through. Love the way you used the stencils! Very interesting work. Love your pages! That Nietzche quote is a favorite of mine and I love how you used it with the stencils to make such an awesome art journal page! Both lovely projects, th a 's for sharing that you also adapt and play as you go along. I truly appreciate the explanation of how you created this piece with such gorgeous texture. I really like it. Thanks. Now, I have to go check out this "groove tool!" Love these and need these. I have most of the Seth stencils and just love using them. Fabulous! Love your quote and seeing your process. thanks for sharing these lovely projects Janet!! what fun ways to use Seth's stencils! Loving all the touches of detail you've incorporated from the stencils- and your gratitude journal art- fabulous! The details and colors you've incorporated from the stencils are really complimentary- and your gratitude journal art- fabulous! Really really enjoyed this blog entry! Our styles are similar and I'm not with most people so I was very tickled to see your post. Will be following you in the future! Yay! 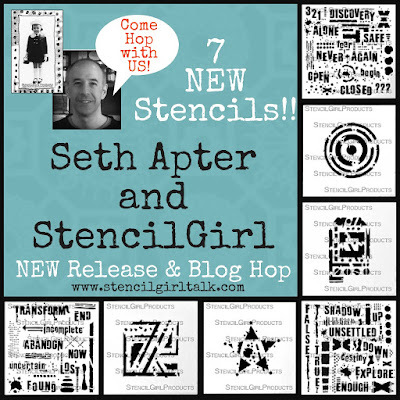 So excited to have MORE Seth Apter Stencils from the Urban Outsiders line! Whoohoo!! whew hew.. like how the various elements popped.. and what the heck is a groove tool? love what you created. Wow, your journal pages are fantastic. I adored how you rotated the stencils to make them even more interesting. I adore these new stencils that Seth has created. He does wonderful work. In the event I win, Seth has my e-mail address. Love the journal pages and how you used the stencils! So vibrant! Really liked how you used the texture components of Seth's stencils. 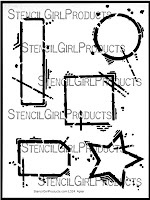 You made fabulous pages with Seth's new stencils and gave us so many ideas!! Love the geometric lines and beautiful color combos! Perfect sentiments as well!! Wonderful pages. I love how you used the stencil to create the border. Great colors too. Very cool! I really love your work. Thanks for sharing. Love what you did with the stencils! These stencils are awesome and I love your journal pages. 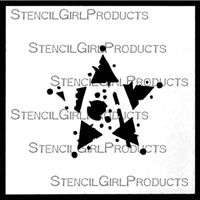 Creative idea on turning the stencil design around like you did! I just love to view how everyone uses stencils in their own inventive ways. I love the way you used these stencils! I am looking forward to getting some for myself. Delicious choice of summery colors. Great layers, and I love the choice of words - very powerful. beautiful colors in your journal pages.. great job on both! Love how you used the stencils and all those gorgeous layers. Thanks for the chance to win as my supply of stencils is rather small. Wow, love the bold colours. Beautiful use of Seth's new stencils. I definitely want to play with Seth's stencils! What a contrast in your pages - love them both! Thanks for the chance! I love the building and layering these give a piece..Great color too! I love the choices you've made here...the colours, and parts of the stencils. Perfect! Wonderful art pieces. First time I have seen the groove tool. Like the way you used the stencils. Thanks for the inspiration. I love the stencils and had never heard of the groove tool. enjoyed your use of these new stencils. Colours and powerful words were great. Loved the idea of using the stencils as a border! More versatility! WOOT! This is awesome! I love the colors you've chosen too! Thanks for the chance to win! Love the stencils and the groove tool. Beautiful project.